maybe if the HD/HP, AC, and special abilities were on a first line together you’ve got all you need for older style games. the ability mods, CR, skill, and other bits can go on another line to cover modern approaches? and the +2 damage in the goblin stats is coming from their dex modifier, not proficiency. You’ve got three groups of information: things I need right now, things I might need right now, things I don’t need right now. “Dont need right now” (cr/xp) could go in the monsters listing in an appendix. “might need right now” could do the same. Monster stats. “right now” can go inline. 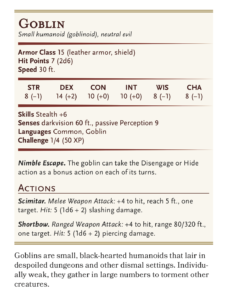 Also, a summary sheet, like from Ready Ref Sheets, could go in the back page, etc, allowing you to just have “4 goblins” listed inline. Cross-references to the page # for more information get bonus points. Proficiency is a long word, and yet you summarize the stat names. See IN the Dark is pretty common. The challenge rating and proficiency bonus for 5E seem actually in some ways closer to HD values from TSR editions (as CR is what determines XP reward in 5E, at least by the book). When I run OD&D, the one stat I include pretty much all the time is HD, from which I derive attack bonus, saves, and other details on the fly. I was thinking that the challenge or proficiency ratings might be similarly useful during play, as a way to derive other general level-type information, based on a few basic guidelines, but I am unsure whether challenge rating and proficiency bonus would both be required for such use. Perhaps proficiency would be enough in concert with HP. 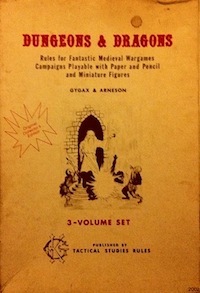 Additionally, people with less experience but some familiarity with 5E might be able to do something with the numbers even if they ignore (or forget) whatever guidelines for conversion I include in a “how to run this adventure” section. Re: long words and shortened stat names: familiarity is a big benefit from going the 5E route at all, so I was leaning toward using the same terms as the official sources. I agree that proficiency is a bit long, but most shortenings are somewhat unclear at first glance (such as “prof”). I thought about “general bonus” or even just “bonus” which also have the advantage of being further from terms in the proprietary grey zone at the cost of less familiarity. STR DEX CON etc are common lingo across new and old school (similarly HP and AC), while the other stats share less cultural overlap. In general, I find page flipping in adventures annoying, even for physical books, and flipping is often even more awkward when running from a PDF on a tablet. That said, a summary sheet in a very easy to remember place might by a good approach, so I will try that out too. Most of the time, I would prefer redundancy at the cost of higher page count (such as redundant sub-maps included in a spread containing keyed locations so that map areas and key can be viewed together). Lightly armored is relevant in that the “natural” AC in the goblin example should be 10 + 2 (DEX) = 12, I think. It would be nice to have a way to indicate the difference between an AC 15 creature that gets the armor from gear compared to an AC 15 creature that has hide or chitin or whatever. But also possibly unimportant? It would certainly make little difference to me if I was the referee. 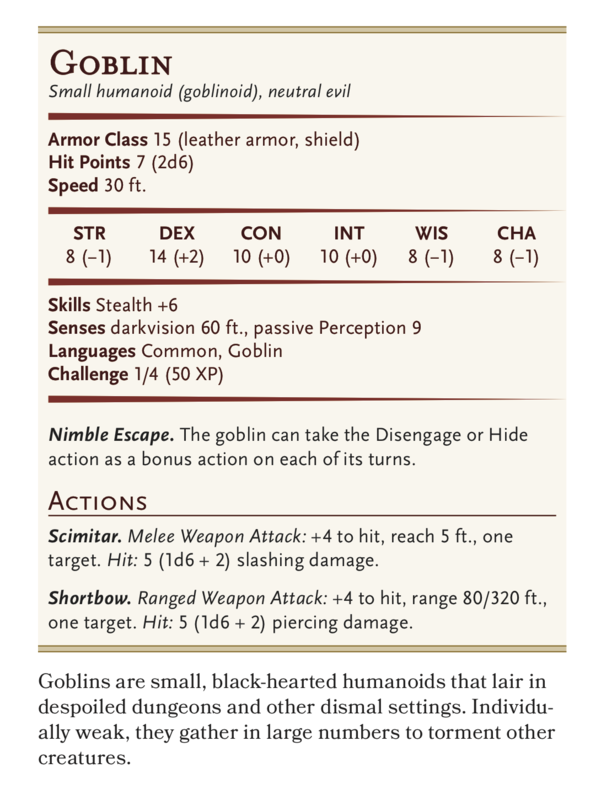 If you could write your ideal inline 5E goblin stat block, what would it look like? What about a basilisk, for a medium complexity monster? Why would you subtract 10 twice when you can just subtract it from 20? I find it more intuitive to think about “rotating” the number around an axis fixed at 10, if that makes sense. So AC 14 becomes AC 6 (14 is 4 above 10, and then take that away from 10 ⇒ 10 − 4 = 6) and AC 19 becomes AC 1 (19 is 9 above 10, and then take that away from 10 ⇒ 10 − 9 = 1). Perhaps this works for me because I tend to think visually, and this is a geometric conceptualization. Take whatever approach makes it easiest for you, of course.